Is your business or workplace adequately safeguarded against fire? If you’re not sure yet, chances are it’s not. Don’t lose everything if a fire breaks out at your office—here are three essential safety measures you need to have in case of fire. Emergency and Exit lighting systems are an integral part of fire protection. The purpose of these is to provide lighting during an emergency, whether it is a fire or a power outage. They illuminate all useable exits, emergency passageways, fire-isolated ramps, and stairways so you can safely evacuate a building in the event of an emergency. The Australian Standards dictate that all Emergency and Exit lighting must be tested every six (6) months to ensure they function as required should an emergency situation arise. A fire extinguisher is the first line of defense to control a small fire. When used correctly, with proper training, a fire extinguisher can be the difference between a small fire and a potentially fatal incident. It is important to know the right fire extinguishers for your business as each extinguisher contains a different extinguishing agent and some, if used on the wrong class of fire, can actually cause more damage. For example, a water fire extinguisher should NEVER be used to extinguish a cooking oil fire. This is why the most common form of fire protection in a kitchen or cooking environment is a fire blanket. A fire blanket is the most effective and safest fire protection to extinguish a fat or oil-based fire. It works by smothering the fire and removing the oxygen. A fire blanket can resist flames up to 500 degrees Celsius and should be within arm’s reach of a cooking surface in the kitchen but located so the user does not have to reach over open flames to access it. It can also be used if a person’s clothes have a caught on fire by wrapping it around them and having them roll on the floor. All portable firefighting equipment must be tested every 6 months. While having the correct firefighting equipment is important for any business, knowing how to evacuate your building if fire becomes too big to control, or another emergency situation arises, is essential. 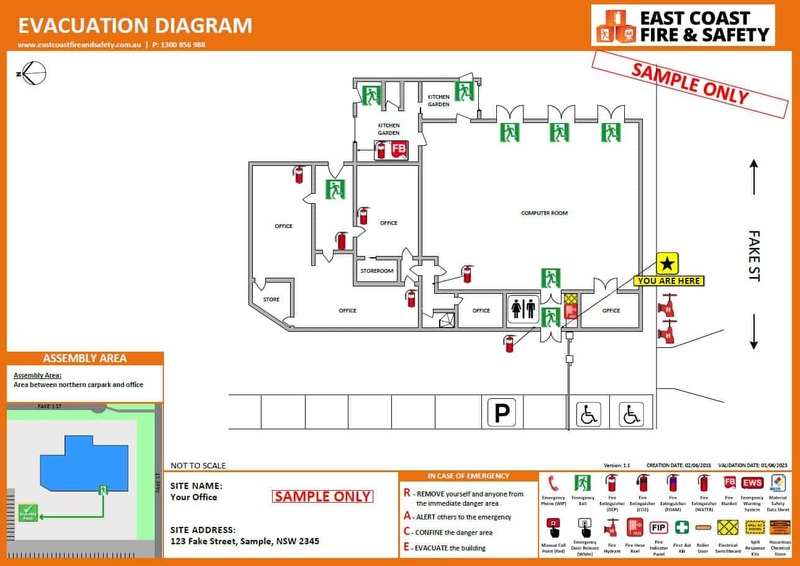 It is mandatory that all Australian workplaces and multiple residency buildings have evacuation diagrams displayed throughout to advise staff, residents or guest the safest exit route out of the building should they need to evacuate. They also provide locations of all firefighting equipment installed, emergency procedures and assembly areas. 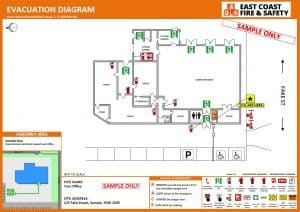 Evacuation diagrams must be reviewed and updated every 5 years or as soon as any changes to the building or location of equipment have been made. How Can East Coast Fire and Safety Help with Fire Protection Solutions? As competent fire practitioner, East Coast Fire & Safety can ensure your workplace’s fire protection is up to Australian Standards. 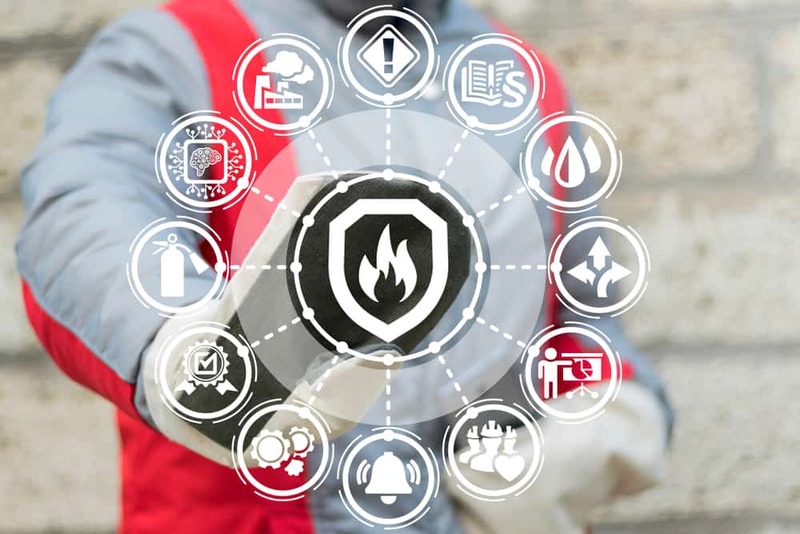 Under the Fire Protection Accreditation Scheme (FPAS), our experienced technicians can advise, install, maintain, repair, and test all fire safety equipment in your workplace. Don’t leave your business to chance—Call East Coast Fire and Safety today on 1300 856 988.